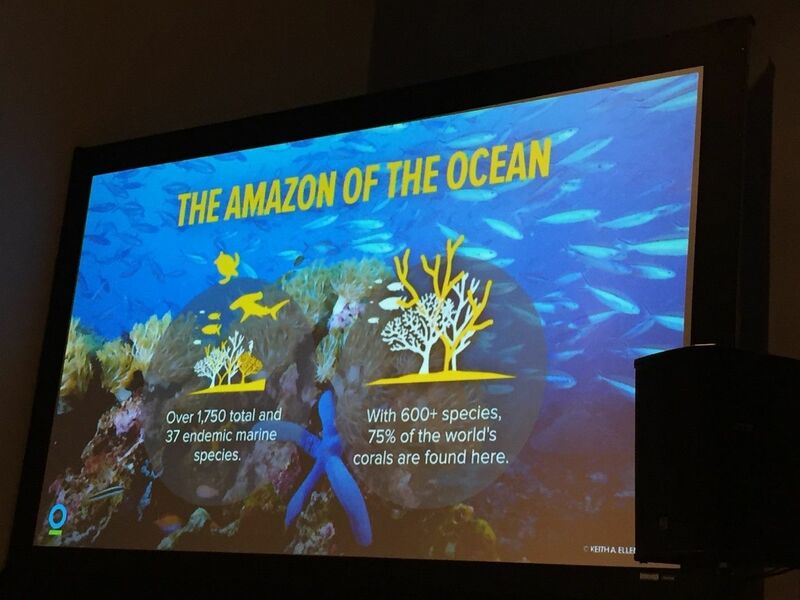 "Saving our Coral Reefs: A Virtual Reality Dive Experience" was the title of Conservation Internationals' talk this year at SXSW Eco 2016 two weeks ago. It was a fascinating workshop about saving our dying coral reefs and one of the projects they are currently involved with. The group used virtual reality headsets to show us a short film called "Valen's Reef that takes place in the Birds Head Seascape in Papua, Indonesia. BHS contains over 75% of our oceans coral reefs and over 1700 species of fish. Apparently, this underwater paradise was decimated by commercial fishing, poaching and blast fishing, (using explosives to stun and catch fish). By the 1990s, fishing populations were down 90% as a result. Indonesians along the coasts saw their livelihoods and fishing rights diminished as outside interests profited from overfishing. Since Conservation International got involved with helping the locals restore their islands, the fish have rebounded and sharks, whales, and stingrays have returned. Poaching is down 90% the coral reefs are recovering, ecotourism is flourishing and the locals livelihood has rebounded. The Bird’s Head Seascape is in the process of transitioning to an independent, community managed, Marine Protected Area and it "stands as a model for other programs around the world". Hopefully this will be just one of many success stories to come in the effort to save our reefs and our planet. If you have never experienced VR technology, watch the video, they have a way to watch it in VR without the headsets. It's like nothing you have ever seen.